in the voice of a friend. but I “see’ you in the beauty of a flower, the sky. in your healing of my pains. as I see Your love spread through Your honorable servants. but I “taste and see” that You are good! in the daily gifts from Your hand. He meets all my needs! He’s in control & loves me; all will be well! I really identify with Asaph. He’s the guy who was fuming over the teflon-coated “fat cats” who never seemed to get what they deserved for all their pride, cruelty, wickedness, and total disregard for God. He even got to wondering if his own pure life was all in vain—UNTIL he came face to face with God and got it all in proper perspective. …I look around me. Life seems so unfair! I become cynical. …I look within me. I am bitter, foolish, ignorant. He holds me, guides me, leads me to a glorious destiny. He is all I want, all I need. He is the strength of my heart no matter what happens. A movie called “Someone Else’s Child” jumped out at me one evening when I needed some mindless relaxation. Inspired by actual events, it turned out to be the gripping story of Corey, who gave birth and then realized eight years later that Christopher, whom she had raised and loved very much, was not her son! Eventually she finds her own son, named Nelson by a couple who adopted him but turned out to be abusive. Corey ends up formally adopting Christopher to ensure that he stays with her. But she also refuses to give up her rights to her natural son. The two boys are told the truth about the situation and have a chance to get acquainted; they get along famously. Amazingly, Christopher is not jealous of his mother’s love for Nelson. He is totally secure in the love of his mother and grandparents, and a close tie develops between the two “brothers.” The movie ends on an optimistic note and one hopes that eventually both boys will be securely united with Corey, living as one happy family. Well, I love analogies, and it dawned on me that this is a beautiful picture of God and His two children. The Jews are His children by birthright but have been separated from Him for a very long time. He longs for them, but meanwhile we Gentile believers in Christ have been adopted into His family, living in his home, enjoying His love and blessings. But God is still seeking to regain His other child, the Jews, and eventually He will. Should we Gentiles be jealous? Should we deny their right to the Father’s love, their place in the family, and their share of the inheritance? No! Rather, we are enriched when they come to find their true home, their true family in their Father’s house. God’s love for us Gentiles is not in the least diminished because of his love for his “birth children,” the Jews. His loving heart expands to receive all who come to Him. One day we will live all together as God’s happy family. And oh, what a great reunion that will be! If we tell our guests to make themselves at home, what does that mean? Does it mean we expect them to raid the fridge? To rearrange the furniture as it suits them? To invite their own friends in? –If something needs fixing, he’ll do it. –He can help himself to whatever I have. –He sets his own schedule of when he wants to do what. –He can bring his friends in to visit anytime. –He can play my piano/music—His new tunes and beautiful lyrics. –He can get rid of the mess & clutter. –He will redecorate, changing out some of the pictures on the wall, etc. –He will delight me with his presence, his love, his wisdom, his stories. –He will invite me to join in his activities. Am I ready for this? Are you? What’s the alternative? Oh no, not again!?! 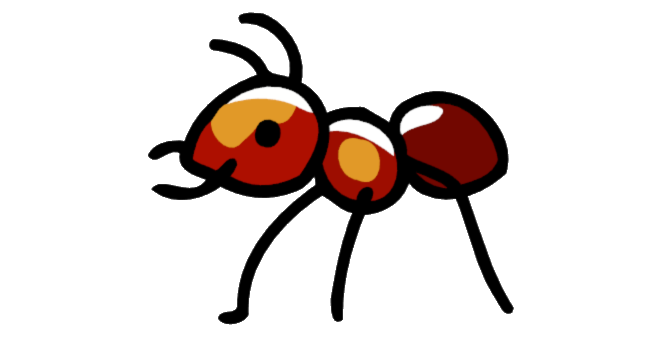 Red ants all over the kitchen counter again this morning. Yes,I know—I’d left a pan soaking in the sink. And yesterday Ron waged another battle with the bukbok (wood borers) that infest the kitchen cupboard as well as the piano and a few other things. We inject more kerosene into the bukbok holes, scribble poison chalk on the ant trails, fill gaps with sealant and glue and occasionally (if all else fails) a quick squirt of insecticide which I react to. But before long they’re back again—doing more damage, making a nuisance of themselves. I have joked that they’re like the Enemy of our souls, never giving up, always plaguing us, finding new ways to get at us, destroying and damaging. But it’s not really a joke. Even if I may think I have them licked, my pride, worry, laziness and critical spirit keep popping out in new ways. Oh, woe is me! When will ever be done battling these? Someday I may live in a different place without red ants and bukbok, but there may be other pests and problems to plague me. I do know Jesus promised that in heaven there will be no destructive moths, rust or thieves! And there I will no longer battle the sinful nature in me that distrusts, disobeys and distresses. I praise You, Father, that Your power is greater. Please seal those holes with Your presence, Your grace, Your greatness and holiness. Keep me vigilant; don’t let my guard slip and give the Enemy a foothold.